One of the great, and completely non-transferable, pleasures of live theater comes from an audience’s willing suspension of disbelief. Whereas most other media demand absolute realism – real walls, real planes, real surroundings of any kind – in the theater (to paraphrase Shakespeare) when actors speak of their surroundings, the audience sees them. This can lead to a specific kind of emotional power, and a fluidity of storytelling, the kind of storytelling amply demonstrated in “Fly” at the Pasadena Playhouse. “Fly,” by Trey Ellis and Ricardo Khan, tells in small the story of the Tuskegee Airmen – the unit of African-American fighter pilots trained at Tuskegee University and sent to Europe to protect US bombers flying over occupied Europe. The 332nd Fighter Group, known commonly as the Red Tails, established an extraordinary record for bravery and excellence, and broke down significant racial barriers between themselves and the white bomber pilots during the heat of battle. Yet, even getting to that place was a matter of a larger battle, overcoming the skepticism of the white officers who would train and assign them here at home. In “Fly,” this tale becomes visceral through a series of theatrical effects. Four fascinatingly individual characters are taken through their training and battle careers on a set made up of four chairs, four trunks, and a series of screens upon which their surroundings – including the skies through which they fly – are projected. It works, as we dive and weave with them through the clouds, or walk carefully with them through the dangers of a night off base in the deep South. Their sublimated emotions of anger, frustration and joy are given “voice” by an extraordinary dancer using tap as a vehicle for the emotions which could not be overtly expressed in their segregated world. An impressively articulated ensemble makes the show work. Brooks Brantly creates the brash W.W., a man from the gangs of Chicago whose ladykiller persona hides a deep-seated drive to rise. Terrell Wheeler becomes Oscar, a man of great principal focused on the importance of this unit to the pride of his race. Damian Thompson creates J. Allen, a man from the Caribbean bringing a more British view to the stresses of training under white officers. Desmond Newsom focuses the story as Chet, the kid of the group – a boy whose fake ID and love of flying has allowed him to sneak into the program. Speaking with his feet to their stresses and celebrations, the extraordinary Omar Edwards takes the art of tap into new dimensions. Providing the stressors upon these young recruits, the casual prejudices of Anthony J. Goes’ training officer underscore the innate prejudice of society at large and the military specifically during that period. As the pilot and co-pilot of the bomber our fighter pilots protect in Europe, Ross Cowan and Brandon Nagle emphasize the changes in attitude forged by battle, and combine with the Brantly and Newsom for the show’s funniest, and in many ways most telling moment: a pseudo-ceremony blown way out of proportion. Under director-author Khan, such scenes become organic, as the play – which runs 90 minutes without intermission – remains compelling watching from start to end. Beginning and ending with modern day, and the final acknowledgement of the impressive feats of the 332nd, the show becomes a neat package of humanity and history, tied together in ways which emphasize the human cost of prejudice as well as conflict. As such it becomes a truly American tale. Special acknowledgement needs to go to projection designer Clint Allen, whose work makes the moments of action come alive on Beowulf Boritt’s cockpit-shaped set. It’s a visual treat, even in its stark simplicity. In short, go see this. The tale is compelling, deeply emotional, and essentially true. The acting is top-notch from start to finish. The minimalism of setting makes the story the star. And the ending is one of the most moving of recent memory. What a marvelous addition to what has long been designated as Black History Month. Every once in a while there is an opportunity to see a great play which has become more historically important than “just” a play. Thus, if done well, the experience not only offers the power and wonder of something well written and well performed, but a kind of awe for all it has taught and has still to teach about humanity, history, and the nature of the human heart. The production of Martin Sherman’s “Bent” at the Mark Taper Forum is one such opportunity. I first read about “Bent” and it’s New York run in Time Magazine, when the play was new, and have always hoped to see a fully realized professional production. In the meantime, its impact could be seen everywhere. The examination of the Nazi treatment of homosexuals was revelatory, even to many activists, when it first appeared in the late 1970s. The story centered on the idea that SS had a separate designation – a pink triangle – for the gays in their vicious concentration camps, and that gay men were the only ones to be treated worse than the Jews. Thus, the play led to the use of the pink triangle as a defiant symbol of pride from the early 80s on. Interestingly, it was only after “Bent” became a sensation that books about this period in LGBT history were able to find publishers. Now we take this knowledge for granted. Which, in its own way, frees the audience currently at the Taper to focus on the play itself. As important as its historical revelations included are the implications of its characters as individuals, and the examination of both the nature of love and the fearsome will to survive. 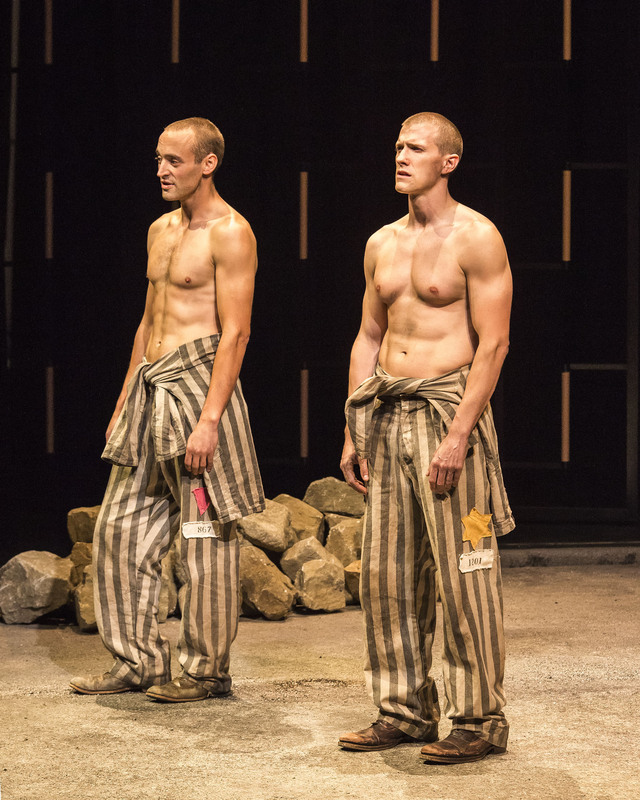 Combine this with the particular horrors of Nazism and the particular restrictions of homosexuality in a totalitarian state, and this play holds a power far beyond an essential history lesson. The focus is on Max, a gay, hedonistic opportunist in Weimar Berlin, always on the cusp of the next deal. As the Nazis rise, he and his lover, Rudy, are arrested and sent to Dachau. There Max works to figure the angles, and begins a friendship of sorts with the “pink triangle” named Horst. Through the horrors of his arrest and transition, he still tries to work survival deals, all the while coming closer and closer to facing the very nature of love itself, as revealed in extremity. Patrick Heusinger embodies Max’s dualities – the ferocious need to control and to win with the softness he cannot recognize – in ways which prove at first funny, then desperate, and then riveting. There is an inner wildness in his portrayal which seems held down with effort to try to manage the world. Andy Mientus makes the fragile Rudy radiate with an inner sweetness one knows will be gobbled up by everything the society around him is becoming. Charlie Hofheimer’s Horst makes no attempts to hide who he is, from the pink triangle on his chest, to his stance – the ultimate challenge to Max’s willingness to compromise himself. Indeed, this underscores the essentials of the story: it is with Horst that Max must face his own demons, one by one, from his need for nurture to the challenge of acknowledging his true identity, even to himself. Director Moises Kaufman has concentrated on the conflicted humanness of it all, giving the entire play an intimacy even in the comparative openness of Beowulf Boritt’s elemental, implied sets (his “electrified fence” proves particularly effective). Sound designer Cricket S. Myers deserves special kudos for the subtextual hummings which flavor important moments of the text, as do Justin Townsend’s increasingly harsh lighting motifs. In sum, this play is powerful, in part because it does not shirk either the brutality or sexuality of its basic themes. The scene where Max and Horst, two Dachau prisoners not even allowed to look at each other, manage to make love with words alone is perhaps the most striking and the most famous. The descriptions of Nazi mind games and tortures, especially the casual nature of them, is both graphic and impossible to forget. This is harsh stuff, from any angle, and yet it is absolutely engrossing – not in the prurient sense, but in the context of relation to the very human characters one connects to so vividly. There are no known statistics on the number of homosexuals who died in Nazi concentration camps, nor of the many more who were castrated to keep their “disease” from spreading. That they were designated, along with the Roma (gypsies), Jehovah’s Witnesses, Emigrants, Criminals, Communists and of course Jews as deserving of their own uniform color code says there were enough to matter. Indeed, considering the behavior toward gays in modern Russia, or worse in the 10 countries in Africa and Asia where gay people face the death penalty for being themselves in 2015, it is important to remember that this is not just old news. And the fact nobody knew much about the Nazi condemnations until nearly 40 years later is reason enough to celebrate a new production of “Bent.” All the more exciting to be able to say this production will prove gut-wrenchingly powerful, yet theatrically satisfying in its own right, quite aside from the impact it once had on our sense of history.